I have to admit my cooking style is rather ‘freestyle’. A pinch of this and a taste of that. But some dishes require a more scientific approach. I had this dish in San Sebastien and thought I would give it a go. When you count in the salt cod (£15), the bottle of olive oil (£7.50) and the digital thermometer (£25) this “peasant” dish starts to become seriously haughty. Buy a nice chunk of cod from the thickest bit of the fillet. Soak in water for 72 hours (my recipe said 48 and the fish was too salty) changing the regularly. Pat dry. 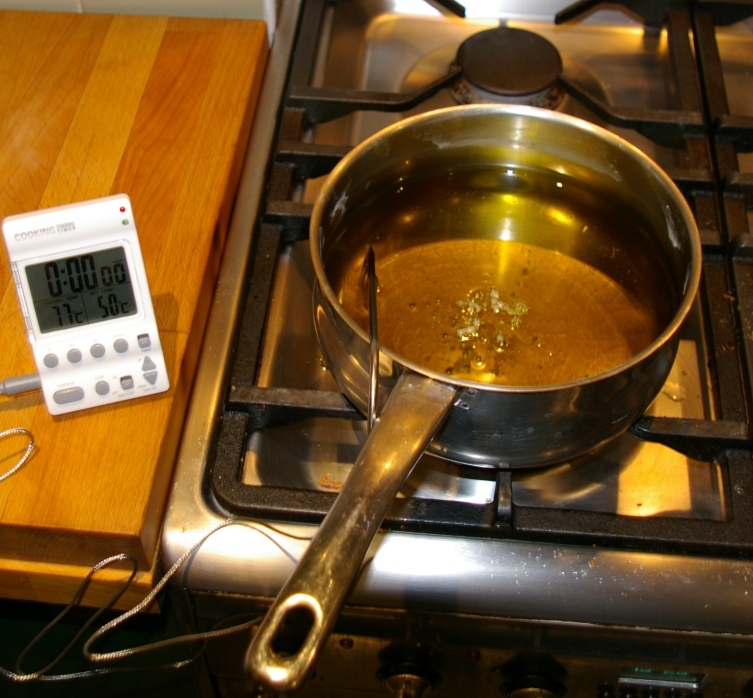 Heat enough oil in a pan so that the fish is submerged – it took me a litre. Heat to 80 degrees Celsius. Add the cold fish which will reduce the temperature, so give it some gas. By turning the gas off and on keep the oil at 70?C for 10 minutes. Lift the fish out and keep warm. Turn up the heat and add some sliced green pepper and fry until soft. Strain and add to the fish. Finely slice enough potato to fill a small frying pan. Add to the oil and fry on a low heat (no colour) until soft. Beat 9 eggs in a large bowl with salt and pepper. Drain the potatoes and add to the eggs. Pour into the frying pan, press well down and pop in a hot oven 170?C and bake until the egg is just set – about 10mins. Serve the warm cod and peppers with the spanish omelette. Verdict: the most amazing tortilla, but the cod though perfectly textured and moist was still too salty. Must try harder!